Anti-malware policies provide protection against many malware threats, including viruses, worms, spyware and trojans by scanning content passing through Guardian. Note: Anti-malware scanning is not enabled by default. You must enable anti-malware scanning in order to apply any anti-malware policies you have created and enabled. For more information, see Configuring Anti-Malware Protection. 1. Go to the Guardian > Anti-malware > Policy wizard page. Tip: Enter a name or part of a name and Guardian will search for names of users and groups that match. 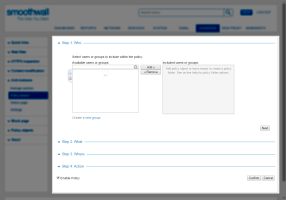 To select more than one user or group, hold the CTRL button down while selecting them. 3. Step 2: What — From the Available categories or category groups list, select what is to be scanned. 4. Step 3: Where — From the list of locations, select where the policy will apply. Click Add and when you have added the location(s), click Next to continue. • Scan — Select this action to scan the content specified for malware. • Do not scan — Select this action to allow the user to access the content without scanning it for malware. 7. Guardian displays the settings you have selected. Review them and click Save to create the policy. 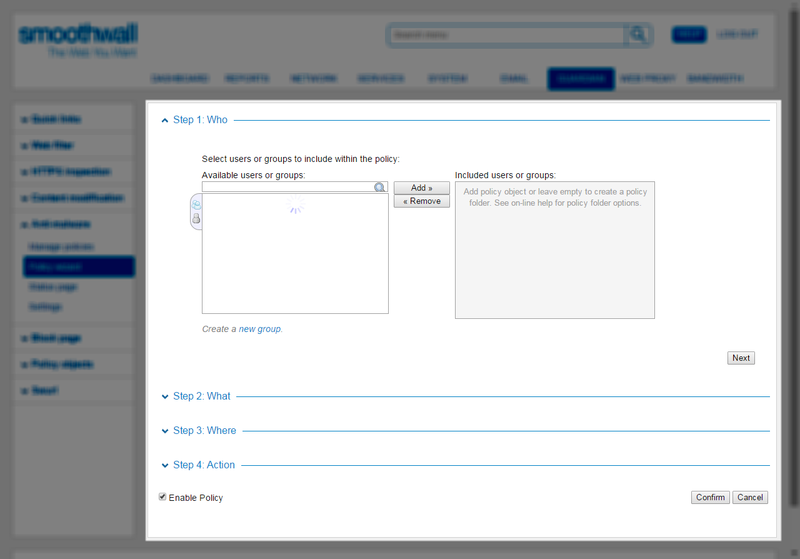 Guardian creates the policy and makes it available on the Guardian > Anti-malware > Manage policies page.